In the deep South, Union forces now have a secure hold on the South Carolina coast. Beaufort is under control of the 100th Pennsylvania Regiment, the men of whom are convinced they are following the directive of God in ensuring the welfare of the freedmen under their protection, following a victorious fall campaign against Confederate forces that had been in the area. When Captain Leasure applied to the Secretary of War for authority to raise an independent regiment among the yeomanry of central Pennsylvania, [Simon] Cameron said, “Yes, Captain, if they will be men that will hold slavery to be a sin against God and a crime against humanity and will carry their bibles into battle”. “I have no other kind to bring.”, responded the Captain. “All right,” exclaimed General Scott who chanced to be present. “We will call them ‘Roundheads”. On December 8, 1861, the Roundheads formally occupied Beaufort and set up camp. The troops brought with them a tradition of publishing a regimental newspaper, entitled the Camp Kettle. 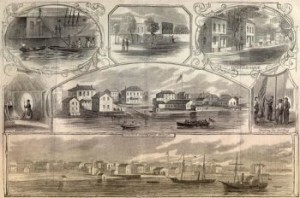 Published at “every opportunity by the field and staff of the Roundhead regiment, Col. Leasure, commanding,” the publication covered regimental, local, social, political, personal and other news. Today’s edition of the Camp Kettle is the eighth, of which four thousand are printed. It is the first printed in Beaufort, and the Roundheads take glee in publishing a northern newspaper in the town that until mere months ago was “The Saratoga of the South! The very nest of treason, in this most treasonable state of South Carolina!” They reckon “Heaven’s ways are just” in that the enemies of “free labor” had fled in “most unreasoning panic” before Union forces, leaving their homes and valuable behind, of which their former slaves had promptly taken possession. The Band of the Highlanders led the choir, which was composed of the whole congregation of soldiers, and the solemn strains of “Old Hundred” pealed with unwonted power in this place so unaccustomed to such an audience, and we may add, such a service, “The Union” was most heartily prayed for, and if these old walls could have spoken the echoe of past services in that place, there would have been a strange Babel of tongues, for the preacher had no sentiment in common with the doctrines of secession. On the following Sabbath, Rev. Browne still being sick, Dr. Peck of Boston, preached to the Roundheads from the same pulpit in the morning and the Rev. Wm. Evans of Stamford Conn. in the afternoon. After the pronunciation of the morning benediction, Col. Leasure varied the service, by stepping to the front of the pulpit, and calling the attention of his men to the fact that, at that very hour, their distant friends were sending their warmest prayers to Heaven for their absent soldiers, asked whether there should be service in the evening–every right hand went up, and he then ordered the company officers to inspect the arms and ammunition of their men, previous to forming for church in the afternoon, reminding them that, before praying to God, it was their duty as good soldiers to look after their powder. The commander of the Roundheads requires his men to attend service with their arms in their hands on all occasions, and a “dress parade” invariably precedes religeous services on the Sabbath, to ensure the attendance of every man, and he has married his men to their muskets, and they make them their constant companions, in camp, field or church. The transfer of northern religion to the city is stark. The ardent voices of Southern Baptist preachers throughout the rest of the South, certain that African slavery is scriptural and ordained of God, are no more biblical than Beaufort’s recently-arrived northern divines. Thus, as the new year approaches, Sundays in South Carolina — the heart of the Confederacy — bear witness to weekly duels over the true meaning of the Bible.